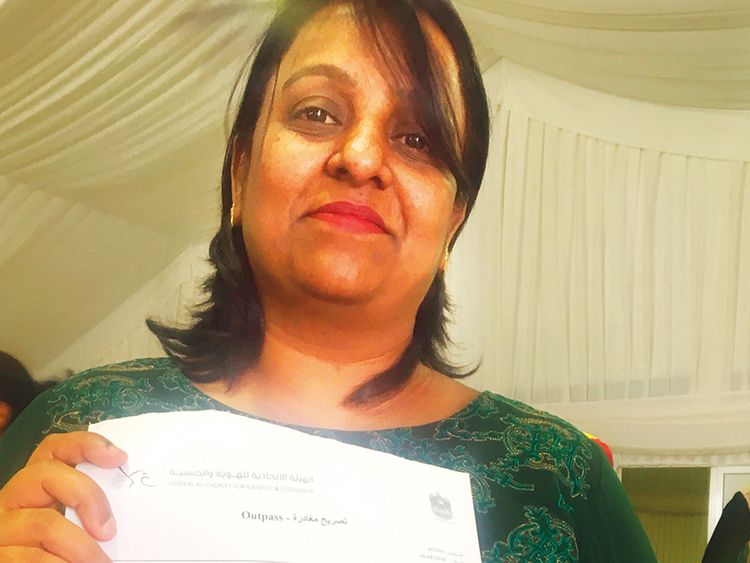 Dubai: After spending a harrowing four months fearing arrest, Geeta Krishnamurthy was overjoyed when she received an exit clearance within an hour and was also refunded Dh500 by GDRFA Dubai. “I am overwhelmed by the efficiency of the department. As soon as they realised that I was not an absconder, they refunded the fee to remove the absconder status,“ said Krishnamurthy, who was maliciously declared an absconder by her employer. Krishnamurthy, a resident of Bengaluru, India, came to the UAE on an employment visa in 2015 to work as an administrative executive in an IT firm. “I went to India on vacation in January 2017, but did not return as my company closed down,” Krishnamurthy told Gulf News on Monday. In March, she went to the UAE mission in India, got her employment visa cancelled and came to the UAE on a one-month visit visa. Her troubles began when she couldn’t find employment and decided to exit UAE on a ‘turnaround ‘ visa (a facility that enables expatriates to exit UAE’s borders and re-enter on a renewed visit visa). However, she was stopped at the airport. “The immigration officer told me that my previous employer had listed me as an absconder. I could not exit the country and was forced to approach the employer who demanded that I pay him Dh10,000,” Krishnamurthy said. She had no money and was living with a childhood schoolmate. “I just cried in distress. I was not an absconder, had my employment visa cancelled at the UAE mission in India, and had entered on a valid visit visa. Yet my local employer was trying to extort Dh10,000. I did not have that kind of money,” she recalled. Krishnamurthy collected funds to hire a lawyer who charged Dh2,000, but did not produce the results she was hoping for. “I was ignorant of the law, had no money and was wondering how I would ever be reunited with my mother, husband and son. It was the darkest period in my life till amnesty was announced,” she said. She finally gathered courage to approach the GDRFA and was pleasantly surprised by the efficient response. Krishnamurthy paid the Dh220 fine plus Dh520 to remove the absconder label from her file. However, when GDRFA officers studied her case, they realised that she had cancelled her employment visa legitimately and had returned to the UAE on a visit visa. “The officers here are very helpful and righteous and I feel vindicated that I am not being called an absconder. I return to my country with my head held high and cannot explain the rush of emotions I feel,” she said. Krishnamurthy is open to the idea of returning to Dubai to work. “My school friend was a guardian angel and she stood by me through thick and thin. I am indebted to the kindness of many people and will return if I get a good job,” she said.